Yesterday I shared my beauty favourites from December with you. Now it’s time for my fashion and lifestyle favourites, and I’ve got a real mixed bag for you – there’s everything from fashion accessories, to books and TV shows. Let’s start with fashion. 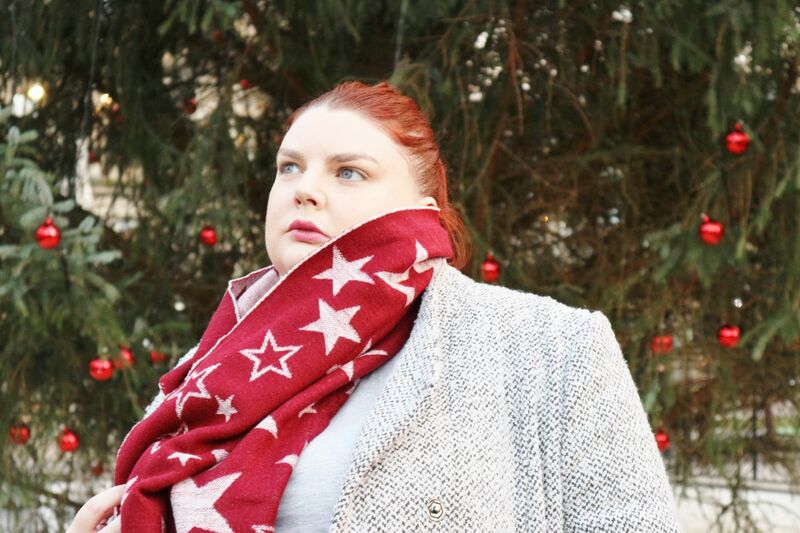 I wore this stunning FatFace Star Jacquard Scarf* (£29.50 from FatFace) constantly throughout December as it’s so festive looking. I love huge scarves, so this one was perfect for me, and it is so soft and cosy too. They don’t have this scarf on sale anymore, but they do have the same scarf with hearts on it instead. The other side is white with a red pattern, so you can wear it inside out for a different look. 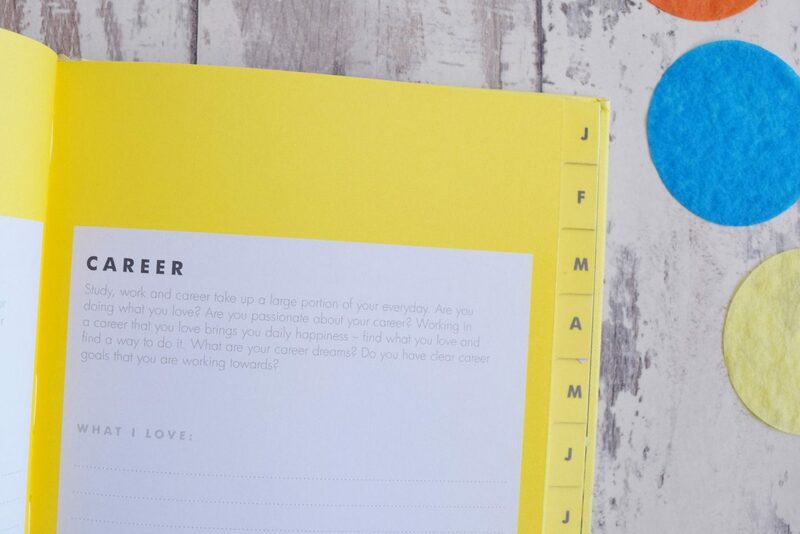 Onto lifestyle, a favourite from the end of the month is the Kikki.K Happiness Journal (£21 from Kikki.K). I started to fill this out in December, as I got thinking about my career and personal goals for 2018. I’m really looking forward to using this journal each month throughout this new year, to track my progress and keep focussed on what matters to me. At the moment, my life is very far from happy, so i’m hoping this journal will help me improve things. 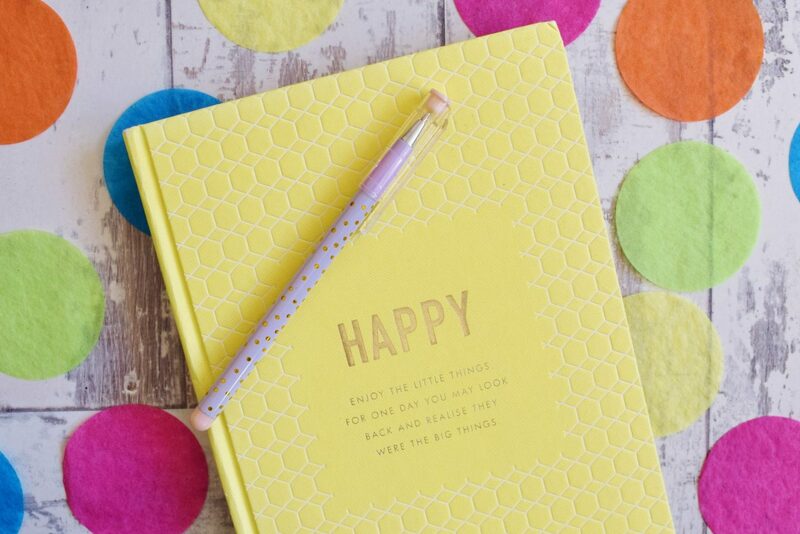 It has such a cheerful yellow cover, and inside it contains sections for each month of the year, full of happiness exercises and goal tracking spaces. It has been so cold outside, so i’ve spent a lot of time warming up inside with a cup of tea. 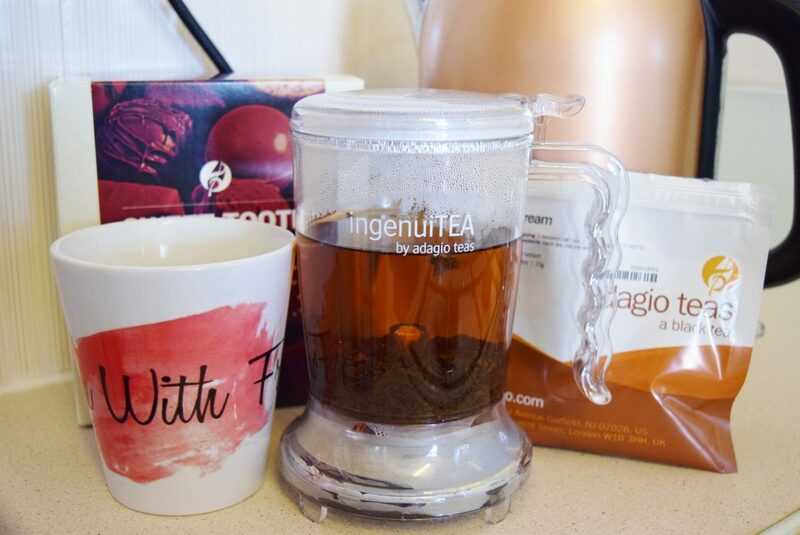 I’ve been loving the tea brand Adagio. They have an unbelievably huge selection of teas and tea accessories. I love their Sweet Tooth Teas Sampler Collection (£6 from Adagio) – four teas with caramel, chocolate and cream hints. In this set you get enough tea for 8-10 cups of each of the four flavours – great value for money. My favourite flavour is Cream – a classic Ceylon touched with the flavour of fresh cream. This tastes of the very sweet buttercream frosting that you get in the US, and it’s a great tea to opt for if you’re craving cake or something sweet. I also don’t know how I made loose leaf tea before I had an Adagio IngenuiTEA Tea Brewer (£18). You just pop in a teaspoon of tea (per cup), pour in boiling water and leave it to brew. When it’s ready, you just sit it on top of your mug or tea cup (which opens a valve) and it fills it for you – so handy and mess-free. Finally, I have some books and TV to share with you. I’ve had quite a difficult few months so I only managed to finish a novel that I started in October, at Christmas. Once I got back into reading in December however, I absolutely loved it. 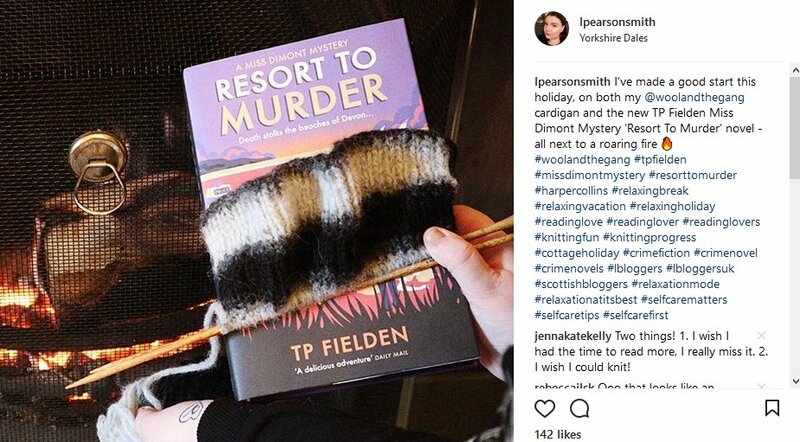 If you love calming, quiet but interesting murder mysteries like Agatha Christie, you’ll love T.P. Fielden’s two novels The Riviera Express and Resort To Murder (£8.98 from Amazon). They are two lovely books to read. They are set in the 1950s and tell the story of Miss Dimont, a reporter on a local newspaper who gets involved with investigating murders that occur in her quiet seaside town. The crimes are well thought out, hold your attention and keep you coming back for more; but they are still a very easy read – perfect for me at the moment. Another book I enjoyed reading in December was a factual, informative one. 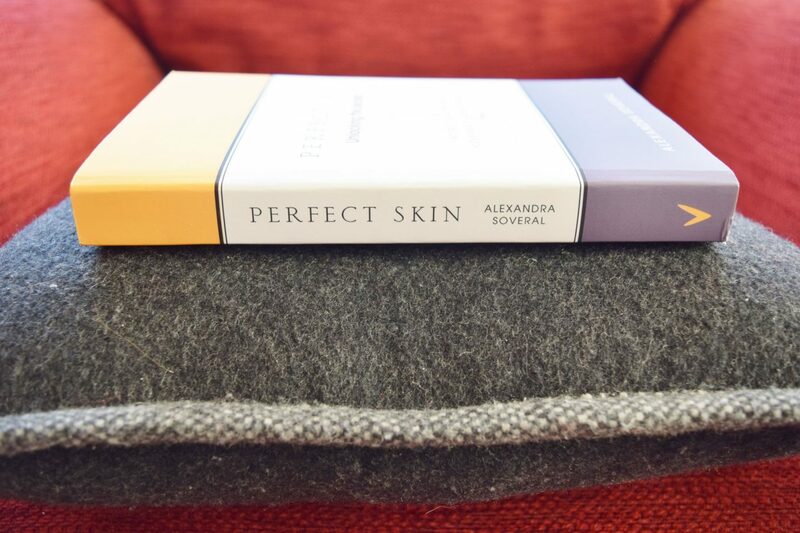 Perfect Skin by Alexandra Soveral (£11.19 from Amazon) is a book that teaches you all about your skin. It shares nutrition advice and skin-friendly recipes, tips on natural skin care products, advice on organic remedies for skin conditions and flare-ups, and really gets into the science of skin. It’s written by a top facialist and is a great book to turn too if you are interested in skincare and want to understand more, or if you have a skin condition and are looking for help with treating it naturally. Onto TV, I binge-watched this 8 episode series in one day. Once I’d started I just couldn’t stop watching. It was so incredibly gripping and the investigation techniques used in it were so fascinating. 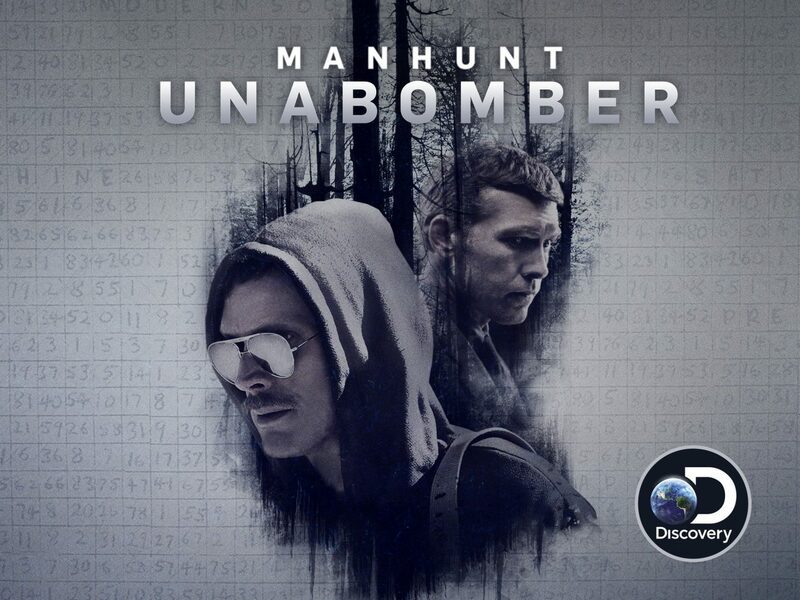 Manhunt: Unabomber (available on Netflix) tells the true story of how the FBI tracked down and caught the Unabomber – a man who mailed bombs across the USA. The FBI’s techniques were so innovative at the time and paved the way for so many other crimes being solved. This story held my attention from the first minute to the very last, and I can’t recommend it enough. If you like true crime or police procedural dramas, I think you’ll love this.